Saved Replies are pre-crafted responses that you create around your frequently asked questions. Using Saved Replies can reduce response times by saving your team from typing out the same answers over and over again. Typical examples might include your pricing information, refund policy, and answers to complex questions. Jump here to read our best practices for using Saved Replies. Only team members with the Admin role are able to create and edit Saved Replies. To get started, click on Settings on the left hand side of your dashboard and then select the Saved Replies tab. Saved Replies can also be created from existing responses within conversations. Click on the three dots beneath a response and then click Create Saved Reply. This will open the Saved Replies area within Settings. From there, enter a title for your Saved Reply and click Save Changes. There are two easy ways to insert a Saved Reply into your response. Click on the Insert Saved Reply option within the composer and select the Saved Reply you'd like to use. Use the ## keyboard shortcut, and using the up and down arrows on your keyboard, select the Saved Reply you'd like to use. Don’t guess which questions require Saved Replies. Ask your team what they’re typing out day after day. Review their recent responses by downloading the Conversation Details CSV from the Overview Report and filtering for outbound messages. Which responses are you seeing over and over again? While the ability to create new Saved Replies is limited to team members with the Admin role, that doesn’t mean you can’t involve your team. Why not start a shared document, where your team can collaborate on Saved Replies? Each team member has their own unique perspective and tone. Try to incorporate suggestions from others, and avoid using bland and robotic language. Remember, the key to creating great Saved Replies is to make sure they don’t sound like canned responses! There is a big difference between a team member knowing how to insert an answer, and actually knowing the answer. Creating a Saved Reply before there is a real need for it, can lead to team members leaning on quick solutions, before they’ve understood the real nature of the problem. Relying too heavily on Saved Replies can result in knowledge gaps. Saved Replies should be used to save time, not to save on training. This is especially true for new people joining your team; it's best to use Saved Replies as an aid, rather than a crutch. 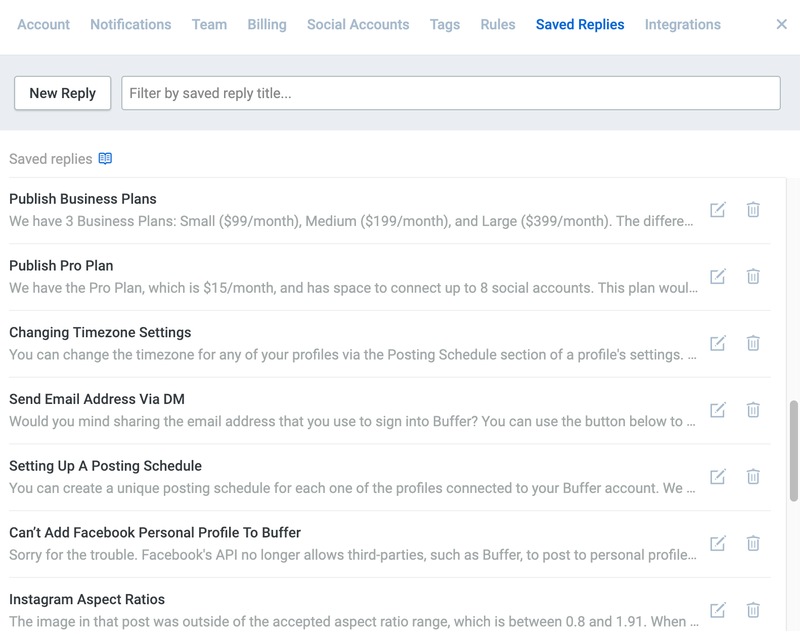 At Buffer, we think of Saved Replies as a luxury. They save us time, but we could live without them. If the feature broke (we have no intention of breaking the feature!) our response times would slow down, but we’d still know all the answers. Additionally, it’s good to keep in mind that any custom signature you have in place would also be deducted from this character allowance. At Buffer, around 70% of the replies we send are public Tweets, with the remaining 30% being made up of Twitter Direct Messages, Facebook private messages, and a few Facebook comments. With this in mind, we create most of our Saved Replies within 250 characters, since the majority of them will be used within public Tweet responses. We try to stick to 250 rather than 280, to leave room for personalized greetings and people’s signatures. Saved Replies don't always need to be full responses or answers. They also work great for things like email addresses, phone numbers, and useful links. These pieces of information tend not to change from customer to customer, so dropping them in using a Saved Reply means you can still give each user a personalized response, but without typing out the same thing over and over again. Saved Replies are great for things like pricing information, refund policies, and answers to complex questions, but the idea isn't to remove the human element from your interactions. After adding a Saved Reply to your response, it's a good idea to personalize the overall message. Don't forget, lots of conversations that take place on social media are public, and seeing a stream of the same response on a brand's Twitter feed is never ideal. Try adding a friendly greeting, using their name, and including a fun emoji! Knowing you have a library of Saved Replies can sometimes lead to rushing from one question to the next, without taking the time to read and understand what the user is asking. There’s a time and a place for Saved Replies. Try not to use them in situations where a personal response is needed. This is especially true where your product or service has caused difficulties or disappointment. At Buffer, we don’t create any Saved Replies containing the word “sorry”, and believe that all apologies should be personal and genuine. We recommend reviewing and refreshing your Saved Replies frequently. Products change, services are improved, pricing is increased, business hours are extended… All of these things could mean that your Saved Replies need updating. As well as needing to ensure the content of your Saved Replies is accurate, it’s also helpful to refresh the wording so your team is not repeating themselves for years on end!